An archaeologist in the Department of Art History at the University of Wisconsin-Milwaukee is exploring the past using the tools of the 21st century. Derek Counts, professor and chair of art history, and his team are looking at how new tools like iPads and 3D scanners can replace dusty notebooks, sketchpads, pencils and cameras at archaeological sites and museums. Mobile computing (for example, with tablets, even smart phones) is becoming more and more the normal way of collecting, mapping and archiving information, says Counts. For the past several summers, Counts’s archaeological project at the site of Athienou-Malloura on the island of Cyprus, has implemented protocols for using tablets in the field. Counts is Associate Director of AAP, the Athienou Archaeological Project. The project, which includes both graduate and undergraduate students from UWM, as well as staff specialists and students from the U.S. and abroad, has been investigating the site since 1990 under the direction of Professor Michael K. Toumazou of Davidson College in North Carolina, with funding from the National Science Foundation since 1995. With iPads and other tablets, researchers at the site can jot down notes as they excavate items, look up information on relational databases, create spreadsheets, complete drawings, take photos and make audio and video recordings to insert into their notes as they work. Off-the-shelf apps such as Pages, Numbers and iDraw facilitate the processing of information and the creation of “born-digital” data – recorded information that begins its life in digital form. A stylus even allows field workers to add drawings. While laptops have long been an option for field archaeologists, they were more prone to damage from dust and dirt, were bulkier and had more limited power compared to tablets, says Counts. Derek Counts and his colleagues from Creighton University and Wentworth Institute of Technology received a National Endowment for the Humanities Digital Humanities Start-Up Grant to present a two-day workshop on using digital technology in the field. “Mobilizing the Past for a Digital Future: the Potential of Digital Archaeology” will be hosted by Wentworth in Boston, Feb. 27-28, 2015. 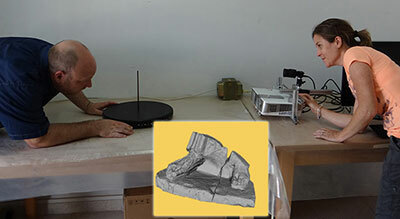 Counts’ team in Cyprus is also looking at how advances in 3D imaging and printing can help put the scattered pieces of the past back together. A Faculty Research and Creative Activities Support grant from the UWM Graduate School, as well as a collaborative grant from Creighton University, is supporting this collaboration with University of Kentucky computer scientists. With help from the University of Kentucky Center for Visualization and Virtual Environments, Counts and his colleagues, including UWM Anthropology Ph.D. student Kevin Garstki, are exploring how structured light 3D scanning can capture both the surface and geometry of artifacts. They hope that this technology will eventually help put artifacts that have been excavated in pieces back together again. The same technology can produce three-dimensional models of artifacts, allowing researchers around the world to study pieces online. This innovative technology could help archaeologists and art historians in a number of ways, says Counts, including allowing archaeological objects that have been broken and scattered over a wide area to be digitally reassembled. In their work, for example, Counts and his team have excavated more than 4,000 fragments of broken limestone and terra-cotta sculptures. With the use of 3D imaging, information databases and computer algorithms, the researchers could search tens of thousands of fragments to find “joins” that might help them reassemble the puzzles. The digital scans also allow researchers and art lovers to study details of color, texture, and size, making it easier to study and interpret objects within their cultural and historical context. These high-resolution images can bring out details not visible to the naked eye, allowing scientists to study them much more closely. Counts notes that on one terra-cotta figurine, for example, the research team found the 2,500-year-old thumbprint of the sculptor. Matching the fingerprint of that anonymous artist to fingerprints on other pieces would allow the team to help link the sculptor’s work to a place and time. Most significantly, making 3D scans will allow researchers to study artworks at a distance, leaving the originals in museums in their countries of origin. Three-dimensional printing goes further, making it possible for researchers to hold replicas of these objects in their hands. Without even traveling, “people can experience the art of Cyprus in a really dynamic way,” says Counts.